Probably you want to combine several video files with different formats like MKV, AVI, MP4, FLV into a single one so that you can enjoy these videos without any interruption. More so, you can also cut the unnecessary scenes from these video files before saving them. Don't worry, with Wondershare UniConverter (originally Wondershare Video Converter Ultimate) which proves to be a good video combiner and cutter, you can join videos together with ease. Step 1 Add the videos you want to merge. Before you start, you need to add the videos to Wondershare UniConverter (originally Wondershare Video Converter Ultimate). 2. A File Explorer dialog box will open from where you can select the videos you need to join. Step 2 Choose the output format and Enable the Merge swtich. 1. Click the drop-down icon beside Convert all files to to enter the drop down list of the output format. 3. 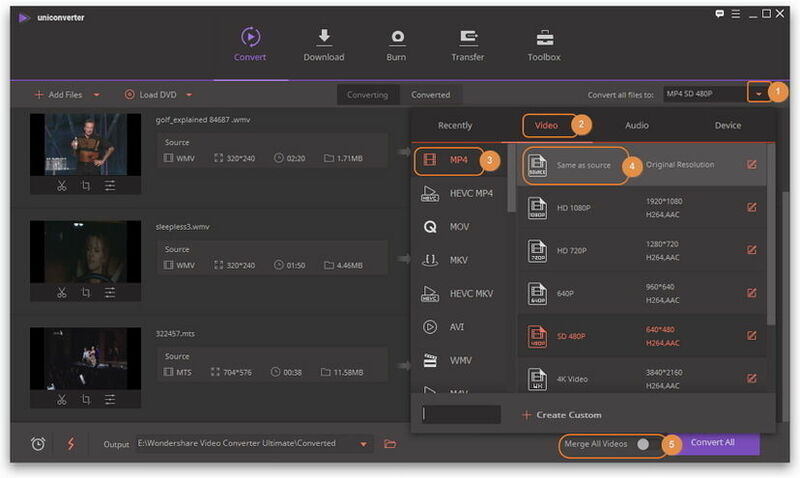 Choose a video format like MP4 as the output format. 4. Choose the preset for the output format. Here, you can choose the preset without a specified resolution to convert with the original resolution by default, or choose a different resolution for the video, double-click it. Then, the selected output format will be shown at the right side of the Converting window. 5. Enable the switch Merge All Videos at the bottom-right corner. 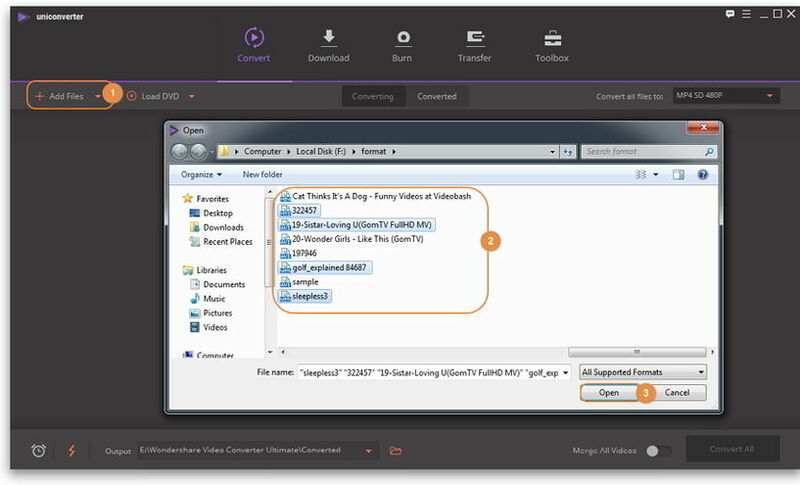 Step 3 Start joining video files into one. Click the Convert All button at the bottom-right corner to start combining multiple videos into one. After a while, you can click the Output icon to get the merged video. 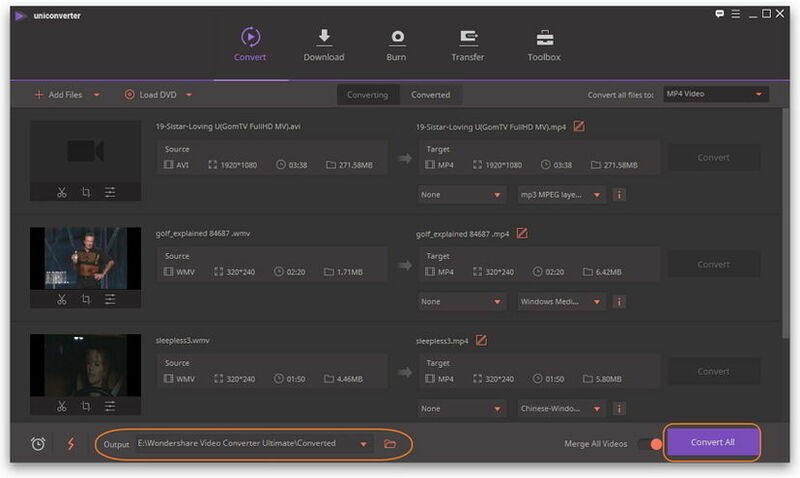 As a professional video merger and cutter, you can cut partial unwanted part of the video and merge video clips into one again with Wondershare UniConverter too. Just refer to the situation 3: Cut the unwanted part of one video of trimming video to learn more detailed steps.